If you’re looking for the ride of your life, then an air boat ride at Airboat Adventures might be right for you! When you visit New Orleans, there are so many fun things that you can take your family to do. 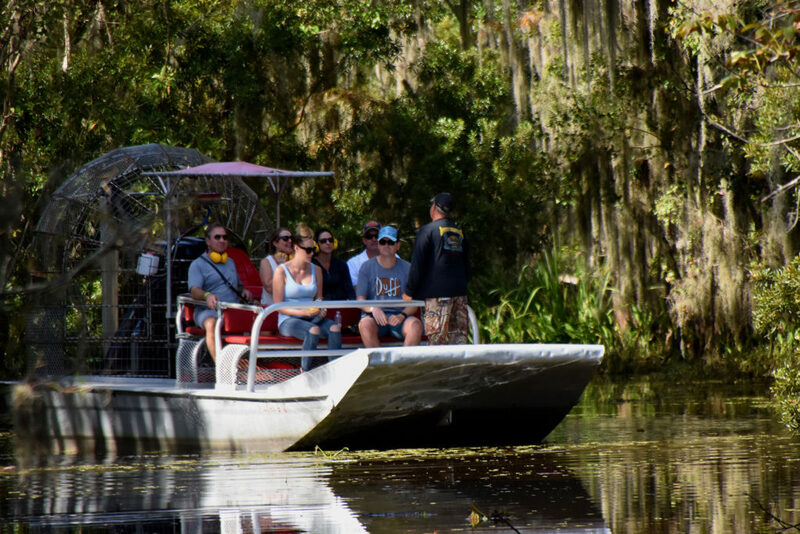 If you’re looking for an authentic Louisiana experience then you do not want to miss out on an air boat ride in New Orleans’ swamps. With large and small tours, every ride is unique and it will be a memorable experience for your family. When choosing your air boat ride, you want to keep a few things in mind. Especially the number of people in your party and the experience you are looking to have. Do you have a smaller group and want a more personal experience on the water? Well, one of our smaller boats might be perfect for your trip. Looking to take the whole family? Our large air boat rides may fit your family and your needs better! Whatever air boat ride you take, you’ll have an authentic Louisiana bayou experience. Now that you’ve chosen your airboat, it’s time to iron out the details. We are located approximately 30 miles from downtown New Orleans, which is about 45 minutes by car. Keep in mind that there are not any ride-hailing services such as Uber or Lyft in the area but there is no need worry. That’s because Airboat Adventures will make arrangements to pick you up from your hotel in the greater New Orleans area and transport you to and from our facility. All you have to do is give us a call to book your trip and set up the details and we take care of the rest. Now that you have all the logistics figured out, it’s time to reserve your spot! We recommend booking in advance to ensure your spot on our air boats. We will do our best to accommodate you but we highly recommend making a reservation beforehand. When you book your air boat ride you can look forward to seeing everything the bayou has to offer. Get ready to see some amazing wildlife, beautiful views, and experience the air boat ride of your life. We cannot wait to give you an authentic air boat ride in Louisiana. Give us a call at 1-888-467-9267 to book your tour and take the first step to an unforgettable family experience. Feel free to contact us with any questions you may have and we would be happy to answer!